This should make the Optune system easier to use. ST. HELIER, Jersey --(BUSINESS WIRE)-- Before starting treatment with Optune in October 2015, Michael Olson, 39, of Beaumont, Texas , worried about how he’d incorporate the treatment into his life and practice as a dentist. It wasn’t long before he started feeling comfortable with the device, and he says half of his patients don’t notice he is wearing it. 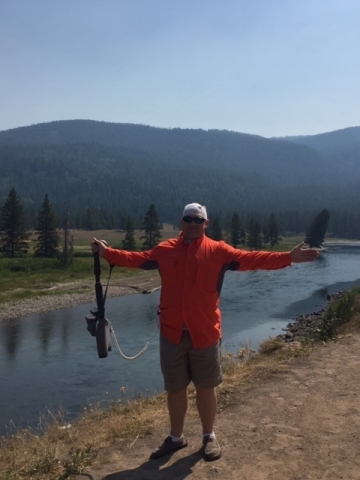 Mr. Olson, a father of two, was able to continue working full time and continue doing the things he enjoyed while receiving treatment with the first generation Optune System. However, he recently received the second generation Optune System, which is less than half the weight and size of the first generation Optune System. He says he can carry the device comfortably while treating patients and the batteries are easier to change. He further enjoys not having to stop treatment to change batteries or power source with the device’s “No-Stop Swap” feature. The new features of the second generation Optune System also have helped Mr. Olson when traveling with his family. This summer, the Olsons spent eight days in Yellowstone National Park . Mr. Olson said that, based on his recent experience, he expects managing the device while traveling will be easier, which he believes will help with his treatment compliance. For their next vacation, the Olsons plan to visit Hawaii . “I can absolutely incorporate Optune into my daily life,” said Mr. Olson, who has aimed to maintain as much of a normal routine as possible since his diagnosis. Mr. Olson is one of the more than 500 U.S. patients to convert to Novocure’s second generation Optune System in the four weeks since the U.S. FDA approved the new device on July 13, 2016. Including its battery, the second generation Optune System weighs 2.7 pounds, compared to 6 pounds for the first generation Optune System. The company designed its second generation Optune System for everyday life. Novocure plans to convert all U.S. patients who wish to use the new device within three months. All new patients will receive the second generation Optune System. Novocure’s Device Support Specialists (DSSs) train each patient individually on the new device’s features. In July 2016, Daniel Torres, 61, of Chicago , was one of the first U.S. patients to convert to Novocure’s second generation Optune System. He says that the enhanced carrying comfort of the smaller, lighter device is an important feature for him when he takes walks with his family and helps his wife, Silvia, with household chores. Novocure is a commercial-stage oncology company developing a novel, proprietary therapy called Tumor Treating Fields, or TTFields, for the treatment of solid tumor cancers. Headquartered in Jersey, Novocure has U.S. operations in Portsmouth, New Hampshire , Malvern, Pennsylvania , and New York City . Additionally, the company has offices in Germany , Switzerland and Japan , and a research center in Haifa, Israel . For additional information about the company, please visit www.novocure.com or follow us at www.twitter.com/novocure. In the United States , for the treatment of recurrent GBM, Optune is indicated following histologically-or radiologically-confirmed recurrence in the supratentorial region of the brain after receiving chemotherapy. The device is intended to be used as a monotherapy, and is intended as an alternative to standard medical therapy for GBM after surgical and radiation options have been exhausted.